In Richmond, Virginia, pattern-slinging is practically a sport, and artist Dana Gibson just might be setting a new record. It’s hard to believe that Dana Gibson starts a decorating project by painting everything white. After all, the designer fills her collections of home accents and wallpapers with splendid colors and vivacious patterns. But in her Richmond, Virginia, split-level, the whiteout came first. “If I started by putting colors on the wall, I wouldn’t know how the light would work or what I was going to need,” she says. While she gathered intel, Gibson and her contractor husband, Mark, tackled renovations. They peeled back dark paneling, ripped out cabinetry and carpet, and rebuilt the front steps. Then came the charm: highlighting the ample windows—and distracting from the low ceilings—with crown molding and a wainscot. Some might call the look “Richmond preppy,” but Gibson thinks of it as simply Southern. “There’s an openness to Southern culture that’s influenced me,” she says. “I want my house to look like it belongs to a world traveler.” So she freely cops architectural styles from the European homes she’s stayed in while sightseeing, aims for Aussie-inspired lightness, and gives Mexican folk art center stage. Here’s how she mixed it all together. When the home’s brick steps began to crumble, Gibson decided to boost the character with fieldstone ones. The brick chimney also received a face-lift. “The stone added charm to the house that the brick just didn’t offer,” she says. The painted door (Benjamin Moore’s Blueberry Hill )—a Richmond staple—is a telltale sign of the fun inside. “That’s what you do with your front door. It’s the first image somebody gets of your home, so it’s important,” she says. The light is another special touch. It’s the Richmond Outdoor Hanging Lantern from locally based Shades of Light. “A lot of decorating is just solving problems,” Gibson says. Eight-foot ceilings drove many of her design decisions. “I’m always trying to make them appear higher,” she says. Her roof-raising trickery starts here, where new crown molding and a chandelier draw the eye up. An antique Virginia huntboard that stands at rib height also helps, though Gibson loves it more for the way the humble pine piece contrasts with the ornate heirloom mirror than for its stature. The wallpaper is Dana Gibson for Stroheim’s Peregrine in Multi Bright. These marble-tile look-alikes are actually durable linoleum (try armstrongflooring.com for a similar look). Gibson installed them as an homage to her grandmother’s house. Nothing is more boring to this artist’s eye than a plain expanse of wall. “I’m not a fan of drywall and will do anything to make it more interesting,” she says. The wainscot pulls a one-two punch in the living room, enclosing the space with panels that evoke the European manors that Gibson remembers visiting in her childhood and giving the low ceiling the designer’s sought-after visual uplift. Limited wallspace above the wainscot gave Gibson the leeway to paint it a zippy yellow (Bridget Beari Colors’ Bing Bong). The secret to avoiding a shouting match between patterns is mixing in a tiny print. “You need to have a ditsy pattern,” Gibson says, using the trade term she learned while designing collections of fabric and wallpaper for Stroheim. “It’s a really powerful element to have in a room to contrast with statements like large florals or graphic stripes.” In her living room, a cadre of blue throw pillows in Guppy acts as a foil for the oversize Suki design on the curtain panels (both are Gibson’s studio collection fabrics). Gibson got as far as hanging her own wallpaper design in the dining room before stalling on the decor. Then came an aha moment: “We took the living room rug and put it in the dining room; that gave me cues for what to do next,” she recalls. Gibson’s gray-and-red floral, Poppy, perked up the reproduction dining chairs and directly nodded to the motif in the vintage rug. Pillows in a fuchsia stripe on the chairs continue the theme. “One thing leads to another; I never have a set plan,” she says. The chunky antique table demands a simple but sizable centerpiece. Gibson pulled in five potted plants in mossy terra-cotta pots to fill the bill. “I love mixing international pieces with traditional ones,” Gibson says. To wit, she loosens up her coordinated bedding and upholstery with a Mexican folk art cabinet (turned on its head!) as her nightstand. “Blending that in with the blue-and-white pattern—always a nice palette for a bedroom—is what makes it more interesting,” she adds. If a room feels a bit too stuffy or expected, she heads to a vintage store. “I like finding antiques, because nobody else is going to have them,” she notes. The lampshades, chaise upholstery, and curtains are Gibson’s own fabrics. “I love how bathrooms in Europe are rooms, not just closets,” Gibson says. After expanding the one off her bedroom, she added plantation shutters, marble tile, and a Ro Sham Beaux beaded chandelier to make this room a destination, not just a utilitarian space. A shiplap treatment on the wall relaxes the more precious touches, like the gilded mirror and floor-mounted bath fixture. Even the tiniest warrens in Gibson’s home get her signature dash of raspberry pink, and most often, it comes from wallpaper. “It’s so transformative,” she says. “People don’t use it enough.” She slipped Fatima, a hot pink paper she printed herself, into her vanity to make the small bay look gift wrapped. If it gets messy, she can shut the doors. On her back terrace, Gibson focused on enhancing the lush foliage with a less-is-more design. A sturdy striped fabric from Sunbrella covers Ballard Designs cushions on the wrought iron patio set that she took from her parents’ house. “I like how the stripe blends into the natural world but still gives it a bit of an edge,” she says. 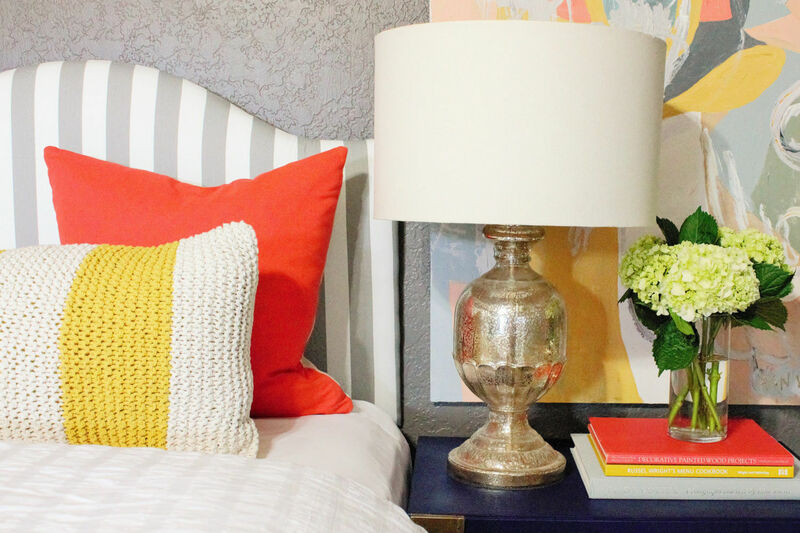 The neutral base also lets her rotate colorful pillows in and out of this often used space. Today, they’re turquoise, but fuchsia is also a frequent accent.